Here’s Who Is Supporting Bklyner — And Please Join Us! 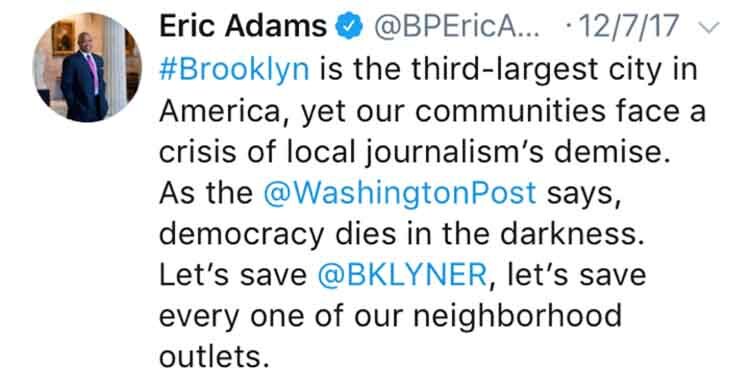 Earlier this month we asked you, BKLYNER’s readers, to help save local journalism and save BKLYNER. You have responded: In a little more than a week, BKLYNER has 829 subscribers! But we are still are working to reach our goal of 3000 subscribers. If you are one of those subscribers — THANK YOU. If you haven’t signed up yet — PLEASE CONSIDER SIGNING UP HERE. You can keep strong local journalism alive in Brooklyn. Join Them By Becoming A BKLYNER subscriber today! Still not sure? Watch Errol Louis’s monologue about us on NY1, or listen to Liena on The Brian Lehrer Show on WNYC. Want to give more? Have other ideas? Email Liena at Liena@bklyner.com.